Some colleagues leave a mark in your heart when they leave your workplace. I have gone through many a farewells; but last friday was very different. A colleague can really make a great difference in your life.There are instances where you never realise the value of the person when he/she is with you. The moment they leave you, it feels all dull and barren. 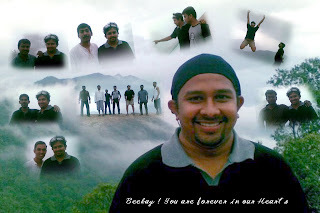 The guy in the picture is B.karthik. We call him Beekay. He was one among us. We have had a whale of a time.Now he has moved to another firm. The lunch time is gonna be dull without his peculiar laugh. The tea time at the pantry is never gonna be the same again. The biking trips might never happen again. Yes! I can hardly forget his laugh. He was such a sport,just like you. I wonder if anyone will write a post about me when I leave my work place. thankyou for visiting my blog.. are you leaving your work place? sweet one! friendships arent forever either...but as long as the hearts know and love each other, the distance dun matter. Can "the one" miss "the someone" whom "the same one" doesnt know at all?